A silver-gilt incense burner of circular form, the bottom part supported on a trumpet foot, the domed top with an openwork, galleried rim. Both top and bottom have a relief decoration of interrupted strings on a uniformly dimpled ground. The slightly recessed base is engraved with the signature of Keisuke and inscribed in red ink with the number ‘623’. The interior of the incense burner is fitted with a removable liner. 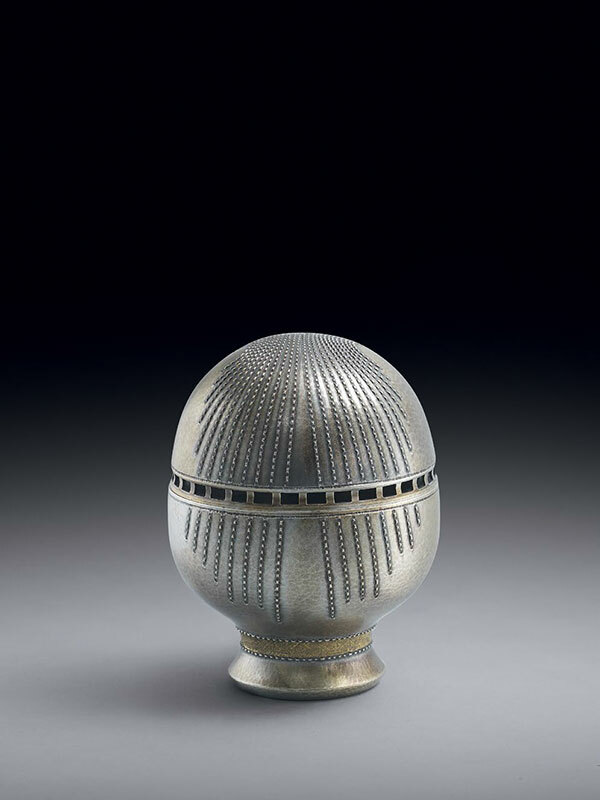 The piece is contained within the original wood tomobako, which is inscribed Nanryo, nunome zogan koro, Keisuke-saku (Silver, Incense burner (koro), fabric pattern inlay design (nunome zogan), made by Keisuke, with the seal Keisuke). ‘Nanryo’ is a literary and archaic name for fine silver. The relief decoration on the two halves of this fine incense burner can be lined up perfectly to form one continuing pattern. The artist Ibuse Keisuke (1930- 2006) was born in Tokyo, a son of the famous novelist Ibuse Masuji. He studied metal chasing and metal smithing, beginning in 1950 under Endo Keishi, Unno Takeo, and Mikami Takeo. In 1957 he won the Encouragement Award at the Seikatsu Kogei-ten (Daily Life Craft Art Exhibition), and in the next two years exhibited at the government-sponsored Nitten art exhibition. Examples of his work can be found at the National Museum of Modern Art Tokyo, and the Takaoka City Museum (Toyama).